When the Americans came to town, the first thing they noticed was the lack of kids being in school, especially girls. They figured kids needed an education in order to get ahead in their future. This was in Pakistan, but also in Niger and Zambia Americans saw the same thing. They tried to raise support in America so schools could be built in Pakistan, Niger, Zambia and many other places, especially on the African continent. They built the schools but many girls would not come to school. Or they would come to overcrowded classes and not really learn anything, so their parents took them out. They were far more productive helping on the farm. In Niger the boys worked in the fields and the girls had to make hours-long trips to get water. Niger is over 80% Sahara desert. These basic jobs kept kids out of school. Water was desperately needed at home. On their way to the pump, the girls passed by the big houses with running water. So, water was accessible, but only to the priviledged. The girls were struck by the opulence for the rich and poverty of the rest, like them. These economic gaps triggered frustration and anger among the poverty stricken. We think about economic aid or education required to have the basics, but more basic is the provision of water. The lack of water, or inequality of water distribution triggers tribal or religious conflicts. Rival factions will use water as a weapon. Maybe they blow up a water line, for instance. Then, Raja and her friends have to travel farther to get water for their families. It is under those circumstances that Americans start to see that each community needs individually designed systems. Having to go after that water, kept the boys and girls away from school. This in turn kept them from getting ahead economically. Economic improvements don’t come like magic. One time, Ben was in England, helping out with soccer camps for children. He stayed with a doctor from Nigeria. Nigeria was poor. The doctor explained that it was not for a lack of water. There was plenty of that, but what happened to the crops storage facilities? What about the roads those crops had to be transported over? There was no upkeep because of corrupt governments. Raja cannot go to school now, because she has to carry water. She had to carry water because waterlines were blown up. Waterlines were blown up because people were angry about the inequality of water distribution. 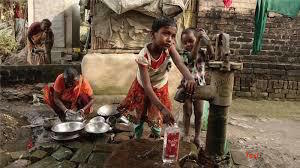 The inequality of water distribution was in part, the result of government corruption: Officials took care of themselves. They had houses with running water. Those were among the houses Raja and her friends passed on the way to, you guessed it: get water.